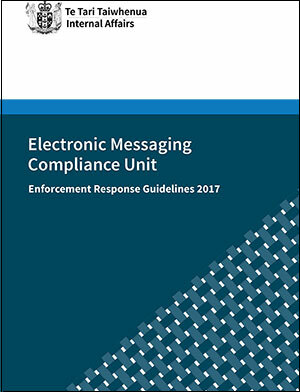 These guidelines describe how the Electronic Messaging Team deals with non-compliance to achieve the most effective outcomes in its role as regulator of unsolicited commercial electronic messages (spam). 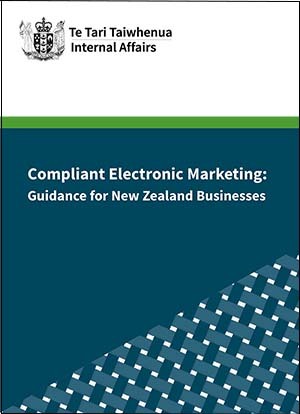 This comprehensive booklet provides in-depth information and useful examples of compliant electronic marketing practices. A 2-page fact sheet providing an overview of the key components of the Act you need to be aware of. This booklet provides information on identifying scams, social media safe tips and strong and secure passwords. 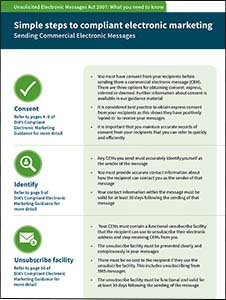 This brochure provides information about combating spam. This information sheet provides information about how you can identify scams to protect yourself and others from harm. This information sheet provides information about the different kinds of scams you might come across. Scammers will do anything to rip you off, so it's important to be aware of the different kinds of scams circulating. This information sheet provides information to help you keep safe when using social media websites such as Facebook or Twitter. This information sheet provides tips for creating strong and unique passwords.